If cooking is your passion then the kitchen is surely your favorite place in your home. The ideal kitchen for people who love to cook would be one that has all the needed facilities complete with top of the line kitchen appliances and kitchen ware. But like the rest of the things you put inside our homes, your ideal kitchen comes with a price. Other than the appliances what people who love to cook would really want to have in their kitchen is enough space to move around in. Cooking is an active task and it will keep you moving –running even. If there is not much room in your kitchen then you may have to squeeze through the limited space in order to go on with your cooking. But not all kitchens are built to be rich in space. However if you really love to cook and you understand the importance of the kitchen then you can definitely find ways to make the small kitchen design work. Another reason why you may have to settle for a small kitchen is a limited budget, but keep in mind that this does not limit the possibilities for you to create a beautiful and workable kitchen. If you are facing this challenge, you should have one ultimate goal and that is to redefine what a small kitchen can look, feel and work like. 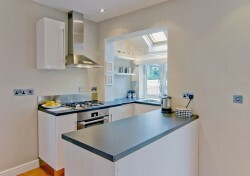 Work with elements that will have positive effects on the kitchen and will help to make it look bigger. Since the kitchen is small, think simple not extravagant, and maximize space instead of hoarding it with appliances. Start with the floor plan. If you are beginning with the floor plan, remember that you want an area where you can move. Imagine the flow of your work when you cook, how you will move from one area to another. Design the kitchen with a direction, like placing the stove between a slightly longer counter top and the sink so you can move from washing and slicing to cooking in one direction. Go for light colors. Don’t shadow and shrink the kitchen by painting it a dark color. Go for bright colors that open the eyes. Another element that will work well with this is the kitchen window. Go big on the windows if you can, allow natural light to come in and draw attention to the outdoors to lead the eyes away from the limited space of the kitchen to the scenery outdoors. When you arrange cabinets and furniture, always position them depending on the length of the cabinet doors when they are opened. Make sure they don’t bump into one another. The same goes with appliances with large swinging doors or drawers. This will make it difficult, even impossible to open these appliances together at the same time when you need to. Lastly, when you have finally put your kitchen together, remember that the space is limited so there’s definitely no space for clutter. Don’t let a pile of dishes or cluttered counters keep you from making the most out of your small kitchen design.